squash, lettuce, escarole, beans, cherry tomatoes, raspberries, peppers. It was so soothing to be outside. Sometimes it feels like the world is going crazy. THAT is why we need our gardens. I have said this over and over: turn off the television, put down your phone, and GO OUTSIDE. Let the scurrying chipmunks, the clever squirrels, and the cheerful chickadees talk to you. They know nothing of the news, they are just going about their business. I find this easier than meditating and I do it every day, usually many times a day. ‘Brandywine Sunset’ perennial mum not only attracts pollinators, it is fragrant too! concentrate. I ate my lunch sitting on the aster bench, gazing upon the perennial mum bench, surrounded by so many painted ladies and monarchs, it was actually stunning. And the bees- it makes me so happy to be able to provide this abundant nectar source for our pollinators. 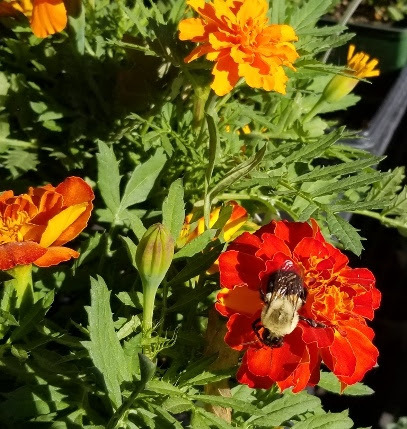 Giant bumblebees hanging out on rich orange marigolds, almost comical in their size. 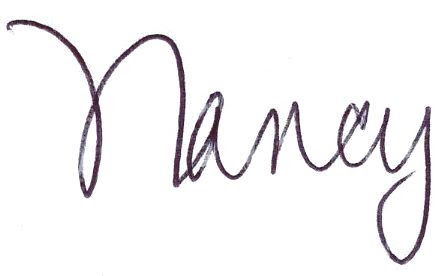 Again, my soul was soothed and I was able to go back up to my office and write to you. 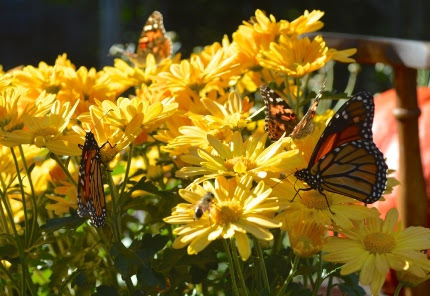 When I wandered back downstairs in the mid-afternoon, dozens of migrating monarchs had discovered our gardens. Stands of asters had 3-4 monarchs on them apiece. My staff and our customers just stood still and watched in wonder. And yes, we did quite a bit of squealing with delight too. Diane took a video and it made our day. 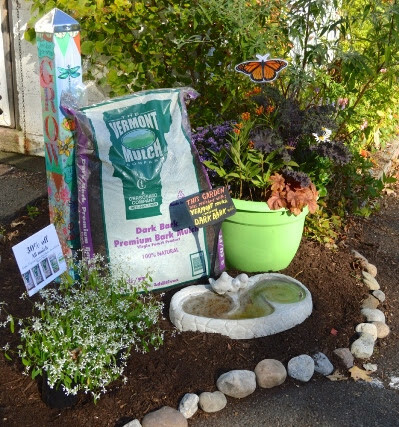 Our gorgeous, dark, premium mulches are now on sale at 30% off! 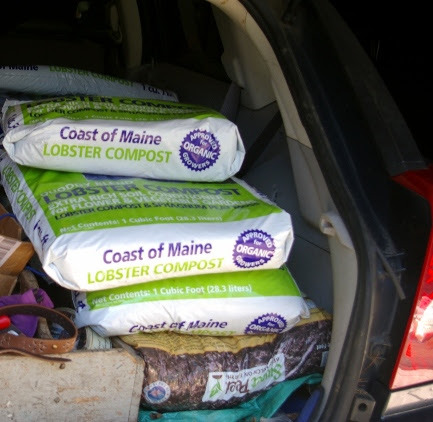 Saturday I stuffed six bags of Sweet Peet mulch (my fave this year) and six bags of compost in my little car to support my weekend planting and rearranging projects. I have a feeling I will be repeating this again this Saturday too! works and then proceeded to plant and plant until supper. Naturally, after planting I mulched heavily for two reasons. One is to keep the weeds from reappearing. The second, and most important, is to keep the soil as warm as possible for as long as possible so that the roots grow and establish. This is an exceptionally hot fall and that makes it perfect to keep on planting, as long as you practice the art of deep soaking. We still have plenty of mulch and my staff has put it on sale at 30% off. It is the ideal opportunity to surround your newly installed or rearranged plants with a thick layer of premium, gorgeous mulch. Next spring you will be SO PROUD of yourself for doing this. Believe me! All of our garlic is finally here! We sell only organic, hardneck seed garlic and we are offering a FREE workshop this Saturdaymorning on Growing Great Garlic at 10 am. I plant 150 cloves in one of my raised beds each year. 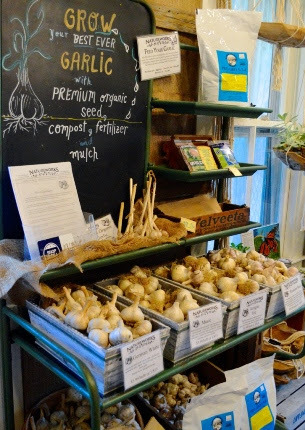 We keep 75-80 in our root cellar for year round use, I sell some at the shop, and I give it as gifts. Each clove becomes one head. Plus, you get delicious, gourmet garlic scapes in June which doubles your edible harvest. We usually sell out of garlic so plan to get in here and grab yours soon. I don’t actually plant my garlic until late October or early November, but I certainly bag it and store it in my garage well ahead of time to be sure I get what I need. I took this photo on October 3rd in our shade garden. 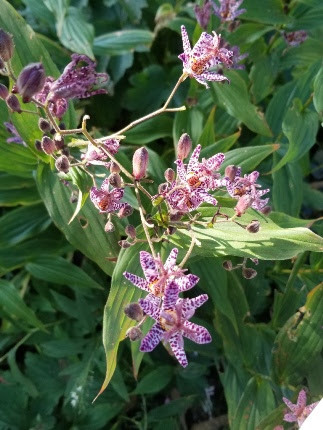 This is toad lily (Tricyrtis) and it has been blooming for a month, with many more buds to come. What’s blooming in YOUR garden this week? by tuning into Facebook Live this Thursday at 4pm. My focus will be Plant Now for Next Fall WOW! 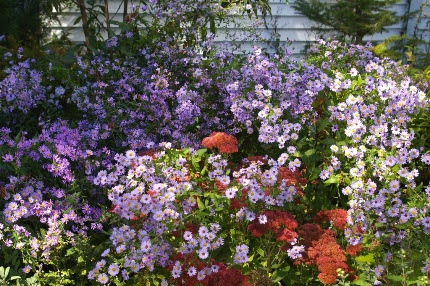 We have such a deep diversity of late blooming perennials at this time of year. In the spring, many of them simply aren’t available. If you plant now you will have large, lush, floriferous plants at this time nextyear. It makes tons of sense to not only analyze what you want but to act on it while it is fresh in your mind and right in front of you. Our perennial mums are just starting to open up and we have so many that will come into their glory later this month and in November. I hate to see the days growing shorter and the light lessening, as a gardener it makes me a bit sad. That is why it is critical that I surround myself with as much late season color as possible. Colchicum bulbs are appearing everywhere- they never cease to surprise me as we add more and more every year. When you buy the bulbs, you will actually be planting them in bud and they will bloom soon afterward. Then, they will grow leaves in the spring which will last for many weeks. Before they go dormant, mark them well. You too will be thrilled with the exciting color they give you right now. 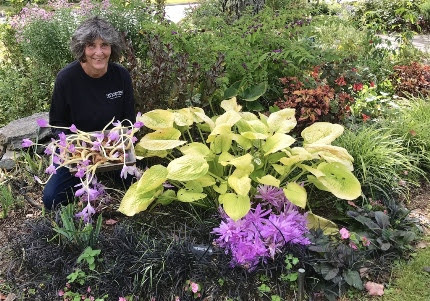 Happy Nancy with a box filled with Colchicum bulbs sitting in the Colchicum patch in our front garden. Fall also means it’s time to start thinking about bringing your houseplants back indoors. Start this process soon. Groom. prune, and repot your plants (we have the best organic houseplant soil and lots of nice clay pots and ceramic cachepots). As the weather seriously begins to cool down, bring them to a transitional area where you can spray them three times in a two week period with an organic, all-purpose insecticide spray such as Neem to kill any aphids, whiteflies, mealybugs, and scale that may be trying to hitch a ride into your warm house. Why three times? This catches the various life cycles, especially the tiny eggs you may miss. BELIEVE ME, it is way better to do this ahead of time. I use my back garage which has a sunny window as my transitional area. I bring in hibiscus plants, my Cestrum nocturnum (with evening scented flowers), a coleus or two, and an assortment of other lovely tropicals. Many I have been overwintering for years and they cheer me up and keep me company when I am missing my garden the most. CLICK HERE to link to our handout called The Plant That Came in from the Cold for all the details. 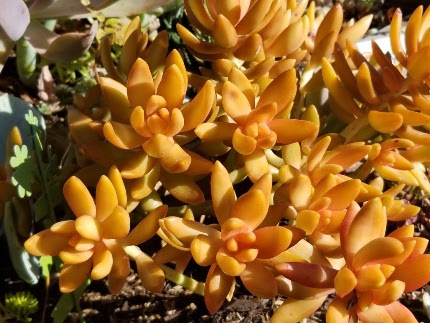 It’s succulent pumpkin time again! 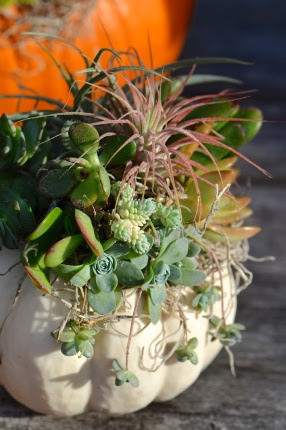 SUCCULENT PUMPKINS and they are so cute! As fast as my staff makes them, they fly out of here. They make great gifts and we welcome special orders for holidays and hostess gifts. Build your Own Modern Succulent Planter. Now, more than ever, we need to contemplate peace in our hearts. Our gardens offer that type of respite, and our peace poles carry messages of love and understanding to a world that is so badly in need of it. We are proud to be your safe, happy place where you can come and relax, away from the troubles of the world. Gardens do that, they are magical places of restoration. Come and visit and see what I mean.